On May 23, 2018 a historic moment occurred in scientific, cultural and humanitarian fields between Great Britain and Azerbaijan. At the Clarendon Building the Vice-Chancellor of the University of Oxford, member of the American Academy of Arts and Sciences, American Philosophical Society, the Academy of Social Sciences in the United Kingdom, an Honorary Member of the Royal Irish Academy and a Fellow of the Royal Society of Edinburgh, Professor Louise Richardson, and Head of the Oxford Nizami Ganjavi Centre on behalf of Azerbaijan, Chair of the Board of Trustees of the British Foundation for the Study of Azerbaijan and the Caucasus (BFSAC), Rector of the Baku Branch of Lomonosov Moscow State University, Professor Nargiz Pashayeva signed the contract under which, the Oxford Nizami Ganjavi Centre for the Study of Azerbaijan, the Caucasus and Central Asia will be permanently functioning at the University of Oxford as its integral part. 'The signed agreement was built on the success of five-year Nizami Ganjavi Program at the University of Oxford – a research program established in 2013 and designed to further the study of the languages, history and culture of Azerbaijan and the Caucasus. As well as providing vital support for graduate students in Oriental Studies and Archaeology, the programme has overseen the excavation of Barda in Azerbaijan, and the translation of major works of Azeri and Russian scholarship into English’. 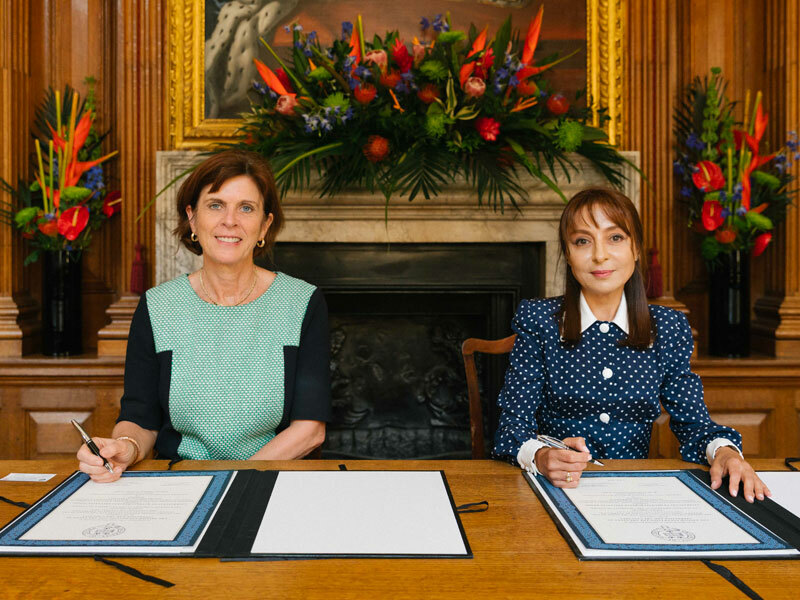 ‘The center will enable the creation of three DPhil scholarships, as well as provides support to visiting researchers and various events and activities program'. The prominent scientific, cultural and academic figures from Azerbaijan and Great Britain participated at the event. They highlighted the importance of the event, stating that there have never been such agreement between Azerbaijan and United Kingdom in the field of science and education. Edmund Herzig, Masoumeh and Fereydoon Soudavar Professor of Persian Studies at Oxford, says: 'There is a long tradition of research on the Caucasus and Central Asia at Oxford, and of collecting books and manuscripts from the region in the Bodleian Library. Until now, however, there has never been a centre dedicated to the study of this region, which has tended to be overshadowed by the big empires and better-known countries around it. Professor Nargiz Pashayeva, Chair of the Board of trustees of the BFSAC and Rector of Baku Branch of Lomonosov Moscow State University, says: 'The signing ceremony that took place at the University of Oxford is comparable to the Contract of the Century in terms of science, education and the culture for Azerbaijan. As part of the Caucasus's historical heritage, Azerbaijan will gain a permanent place to be studied at this exceptional academic institution. By applying modern methodologies and approaches, future scholars will benefit from the knowledge collected here over the past nine centuries and will be at the forefront of current academic discourse. Director of the Bodleian Library, member of the American Philosophical Society, and Fellow of London’s Society of Antiquaries - Richard Ovenden, Masoumeh and Fereydoon Soudavar, Professor of Persian Studies at Oxford, Head of the Oxford Nizami Ganjavi Centre from UK - Edmund Herzig, one of the world`s renowned researchers of ancient Islamic history, member of the Board of trustees of the BFSAC - Professor Robert Hoyland, Oriental Studies Faculty Board Chair in the University of Oxford - Professor Mark Smith, member of the House of Lords, member of the Board of trustees of the BFSAC - Lord Malcolm Bruce, member of the House of Lords, Warden of Wadham College of University of Oxford - Lord Ken MacDonald, Acting Chief Development Officer of the University of Oxford - Professor Anthony Green, Professor of University of Oxford -Julia Bray, Head of the Bodleian Libraries Oriental Section and Indian Institute - Dr. Gillian Evison, Head of the Humanities Division at the University of Oxford - Karen O'Brien were among the influential members of the British academic community present at the signing ceremony. There were also honorary guests from Azerbaijan including the President of Azerbaijan National Academy of Sciences (ANAS) - Professor Akif Alizade, dean of the theology faculty of Baku State University - Professor Vasim Mammadaliyev, director of the Institute of Manuscripts of ANAS - Professor Teymur Karimli, Head of the department of general linguistics of Baku State University - Professor Nizami Jafarov. ‘Although the University has a long tradition of individual scholarship in this field, it has never before had the means by which to draw this expertise together. Thanks to the foundation's generous gift however, it will now be possible for students and scholars from all over the world to collaboratively investigate and discuss the history, languages and cultures of Azerbaijan, the Caucasus and Central Asia, from ancient to modern times’. One of the key items of the signed contract provides for the renaming of the Oriental Library at the University of Oxford to the Bodleian Nizami Ganjavi Oriental Studies Library. Richard Ovenden, Director of the Bodleian Library, member of the American Philosophical Society, and Fellow of the Society of Antiquaries of London welcomed this proposal during his meeting with Professor Nargiz Pashayeva on April 23, 2018. According to the agreement, ‘the center will support the Subject Librarian at the Bodleian Libraries, for the Middle Eastern and Islamic Collections, making it possible for the post holder to add the Azerbaijani language to their area of expertise. A dedicated reading room will also be created for the use of the DPhil students and visiting researchers supported by the Oxford Nizami Ganjavi Centre. Furthermore, the center will enable the Bodleian Libraries to increase its archive of rare and important materials from Azerbaijan and the Caucasus. ‘Named after the poet Nizami Ganjavi, the new centre will be a joint initiative between the Faculty of the Oriental Studies and the Bodleian Libraries. As such, it will play a key role in transforming Oxford into a centre of excellence for the study of this important geographical region’. At the end of the signing ceremony, Professor Nargiz Pashayeva presented a book about the great Azerbaijani philanthropist Haji Zeynalabdin Taghiyev and a photo demonstrating the first session of the Parliament of the Azerbaijan Democratic Republic, in the building of Haji Zeynalabdin Taghiyev`s Girls School to the Vice-Chancellor of the University of Oxford, Professor Louise Richardson. Professor Louise Richardson also presented painting that depicts the University of Oxford to Professor Nargiz Pashayeva. Prior to the official part of the event, the scientists and other guests of the University of Oxford visited the oldest section of Bodleian Library - the Horton Room, Weston Library and viewed a collection of ancient manuscripts and the conservation center. They were accompanied by Head of Development at the Bodleian Libraries, Elaine Gallagher. The participants then were invited to an official dinner held at the "Trapp rum" Hall of Wadham College, which was founded in 1610. Held in a frank atmosphere, the dinner party was followed by an official signing ceremony at the Clarendon Building. The contract signed at the University of Oxford on May 23, 2018, can be titled the ‘Contract of the Century’ as a landmark cultural, historical and humanitarian event in the true sense of the word. This event strengthens the belief that Azerbaijan`s scientific thought and historical legacy will make an outstanding contribution to the global scientific integration and open up new horizons and opportunities in future.